May I greet you with peace and good health. Although the change in leadership was sudden and unexpected, you have graciously welcomed me as well as Bishop Joseph Sartoris to this wonderful parish community. I am truly blessed to be with you, and look forward to meeting each of you personally. By the time you read this message, you might have noticed that the wide screen that was placed on the wall of the sanctuary in the church has been removed. I wanted to inform you of the reasons for it. 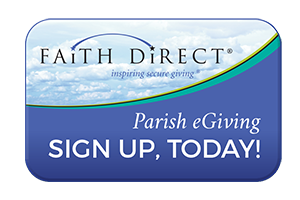 The original intention of placing the screen was to engage the parish community with faith education and evangelization using modern media and technology. This intent was good and welcoming. However, considering the size of the screen, and the place it was installed, several parishioners expressed their concern that it was too distracting during the Mass, and out of place. Liturgically, if there is anything on the sanctuary that diverts our attention from focusing on the Mass, specifically the presence of Our Lord Jesus Christ in the Eucharist, it calls for reflection. While the original intention was clearly not to distract from the Mass, as often occurs when construction designs are implemented, the result was not quite the desired outcome. Therefore following prayerful consultation with Bishop Joseph Sartoris, Fr. George Reynolds and the Parish Pastoral Council, we unanimously decided to remove the screen from the church. We all agreed that, if needed, we can still achieve the original intention by projecting appropriate materials at the appropriate times on the wall of the church without a screen in place, and more importantly, without distracting people’s attention from the Mass. I will be more than happy to meet with you should you have questions regarding this matter.